Japanese fashion company Uniqlo has launched a new version of the Uniqlo Calendar, an online widget providing seasonal videos, music and images of Uniqlo merchandise. Uniqlo Version III can be enjoyed as a screensaver, a calendar on the PC desktop, embedded in blogs, and shared as a musical greeting card. Currently Uniqlo is promoting the winter collection with footage of wintry scenes from around Japan, along with traditional New Year ceremonies and pop culture videos. 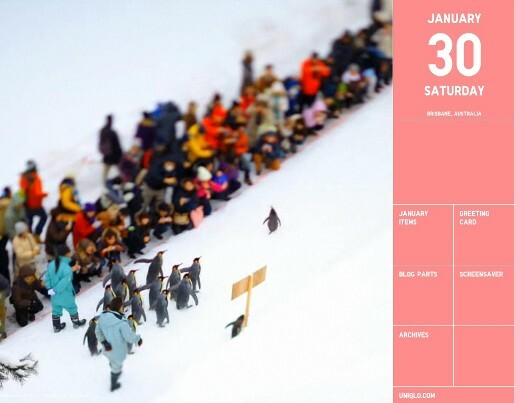 The scene shown here is the Penguin Walk at Asahiyama Zoo in Hokkaido. 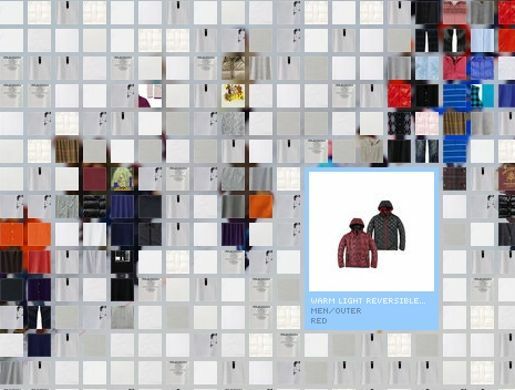 Click on the people in the scenes to view Uniqlo clothing. 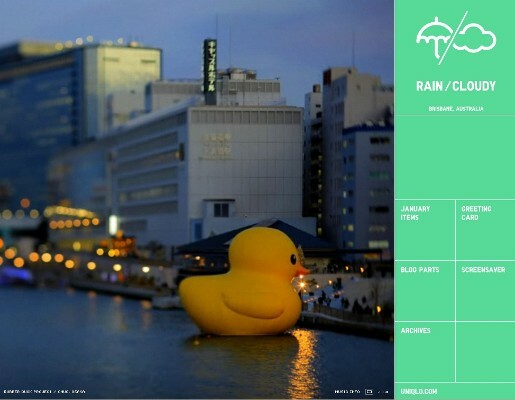 Also shown here is Florentijn Hofman’s Rubber Duck project in Osaka. Uniqlo’s team included creative management director Kentaro Katsube, web producers Ken Kanetomo and Ayumi Shiba. The creative/production team were Projector Inc creative director Koichiro Tanaka, project managers Shinichi Saeki and Yuuri Ogawa, Puzzle Inc producers Gyosei Okada, Nozomu Naito, Shinjiro Ono, production managers Shigehisa Nakao, Takuya Kimata, Ryuichi Hasegawa, Masahiro Kobayashi and Hayato Masaki, SPF Design Inc art director/designer Takashi Kamada, Karate System technical director/interactive designer Kay-ichi Tozaki, 310designo interactive designer Yukio Sato, Sonicjam programmers Susumu Arai, Hiroshi Yamanaka, Kensuke Okuhara. Music was coordinated by Fantastic Plastic Machine producer Tomoyuki Tanaka. See the earlier version of the Uniqlock Calendar.